Jet Meadows, the hero of my novel The Wolf Project, is a Ranger - a member of the elite 75th Ranger Regiment in the American army. 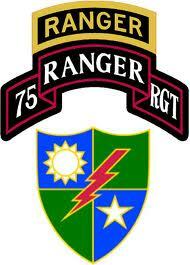 An important part of being a Ranger is to adhere to the Ranger Creed. You can learn more in this short video. Recognizing that I volunteered as a Ranger, fully knowing the hazards of my chosen profession, I will always endeavor to uphold the prestige, honor, and high esprit decorps of my Ranger Regiment.